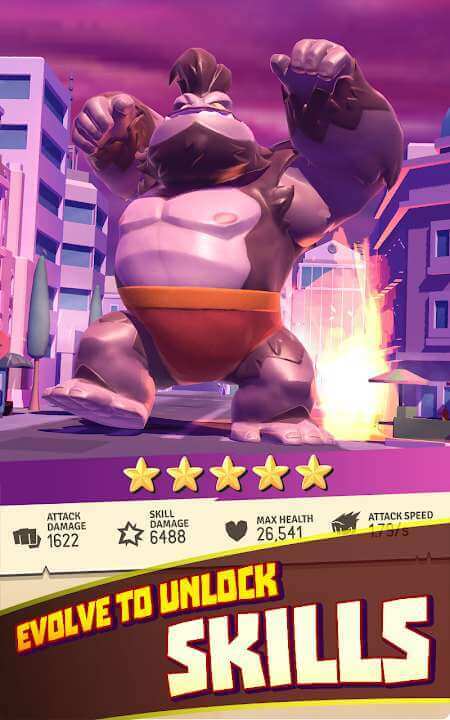 I Am Monster: Idle Destruction – Do you see the movie about Godzilla or Kong that was famous for the love production of the prominent directors of Hollywood? Soon, the latest part of the Godzilla movie is about to be released, attracting much attention from many viewers. If you have a little attention to this genre, you already know how to become a monster. They were vast and large, about the size of a high-rise building, a vicious appearance accompanied by vandalism, threatening people’s peaceful life. Do you want to try being a monster once in your life? 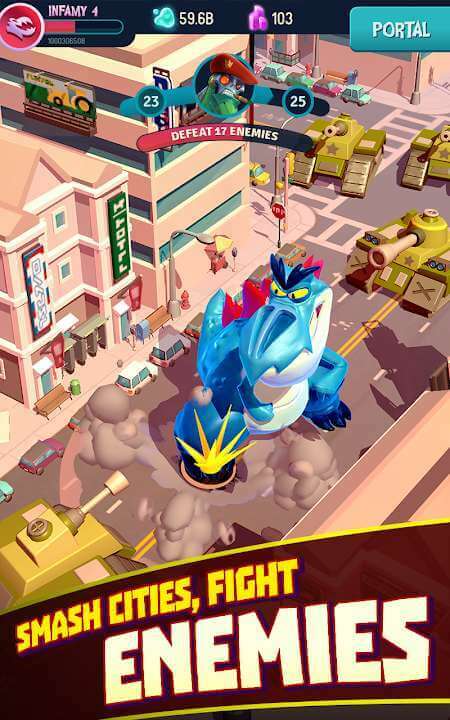 I am Monster is the latest game product of Pik Pok studio. If you are familiar with this game maker through famous names like Fick Kick series, Into the Dead, Rival Stars Basketball, … Then surely feel the appeal of this product. There are many attractive products using animated graphics suitable for many different ages. If you have a look at the trailer, you will see famous monsters that have been adapted into more cute shapes. 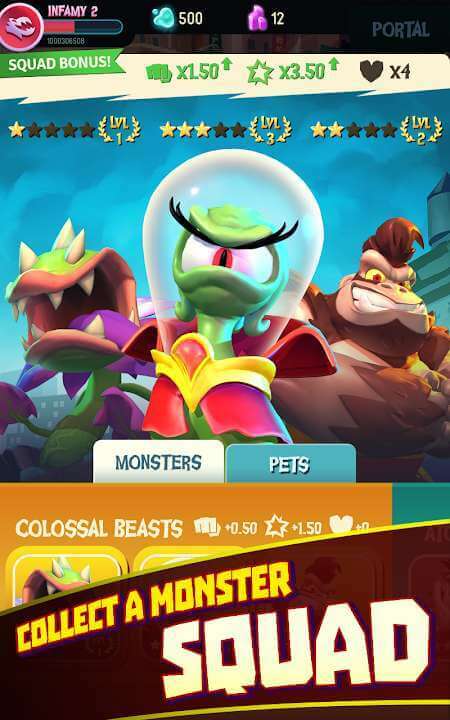 A blue dinosaur, a giant gorilla and alien octopus, … along with many kinds of monsters that you can gradually unlock when you reach new levels and earn enough money. 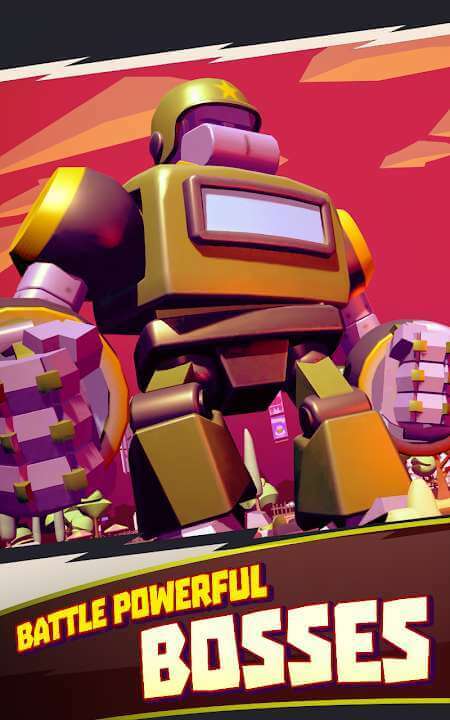 You will play as a monster that really means using all your strength to destroy the city as much as possible. But if there are an attacker and a challenge, don’t be shy and Kill it. They will give you significant power when dealing with damage as well as other special effects. Especially when you face the most powerful bosses, they will bring more power stats than you. Players who want to win them must not only have a perfect lineup with full strength but need to use a variety of clever tactics. In general, the general play of the game is not too difficult when it is almost like an io game. It’s just saying that for easy to imagine and not like, there are some mechanisms that make it work like that. When you enter the game, you will play the role of a monster you chose before. And you will enter a large city, using all your strength to sabotage everything around. The more things that are destroyed, the more size and power of monsters will be increased. There are up to 6 types of monsters that you can freely choose and become one of the most powerful creatures that humans write. Also, these monsters have different skills; they also have an index called Skill Damage. The more evolved the player is, the more damage they will inflict and will destroy more buildings, as well as accumulate enough power to confront the Bosses.